Add Custom Background WordPress in Dashboard how to tutorial. How to add custom background WordPress support option in your dashboard. WordPress 3.0 was released with lots of new better features and functionality than the older version. If you still have the older version, you might want to upgrade it. It is recommended because of security reasons. 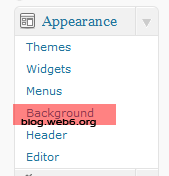 Two of new features of WordPress 3+ are thumbnail or featured image thumbnail and custom background option. Very recommended that you try this on your PC locally, see more on how to install wordpress locally in windows or mac. Why do we need to add custom background wordpress option in the dashboard? Check if your theme gives you ability to change background color of image in its setting OR in your dashboard, under appearance drop down menu if you have “background” link(see image) if not, you can follow the tutorial. Background option you should check. This background option is really lifesaver because it enables you changing your theme background very easy without editing the css file. However there are tons of themes which can be free and premium. Most of premium themes support this custom background wordpress already. But most free themes are not updated and we need to add functions.php code to enable you having background options in your dashboard. In the video tutorial, i use iNove theme for the demo, this apply to any themes you have, everything will works well, unless your theme has default background image or color in its css file. I also explained with iNove theme in the video. The tutorial result using iNove theme. 1.Backup your theme files. You can rename it or download it to your computer. 3. Click “Update File” button. 4. Now you should see background option under “appearance” drop down menu in your dashboard. If we did all corectly we can add custom background wordpress in your admin page (dashboard), either image and color without editing css file. Hi Kimi, Another useful video tutorial. Well these days you’re rocking with these useful tutorials for WP users. Thanks a lot for doing this. BTW I have seen at the end of the post you have mentioned that you’re using Thesis. But you’re not using it in this blog. Where are you using it? Thanks for your nice words! 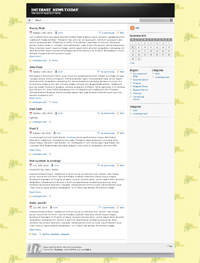 I am using Thesis theme in web6.org (my main domain) because i modified this theme a lot and it needed alot of works, so i use Thesis in my other blogs. Awesome Tutorial. Funny enough, it never occurred to me that changing the theme background can upgrade its looks. I have noticed you use simplicity theme, it can have different result as in the tutorial if this theme has default css file, you can still have the background function but need to tweak the css. Nice one.. Is there a way to make this new background clickable to link to another website? you are a life saver, that was a nice tutorial. i was looking to add custom FB profile, youtube, rss and other buttons on my site, on top of the sidebar. i came across this tutorial, it really works. if anyone is interested, here’s the link.